The capital of Norway is a well-equipped conference city with a cosy and easily navigated city centre. There are meeting facilities for up to 6,000 people and over 13,500 hotel rooms on offer. Oslo is also proud to be in Lonely Planet's top 10 cities to visit in 2018. 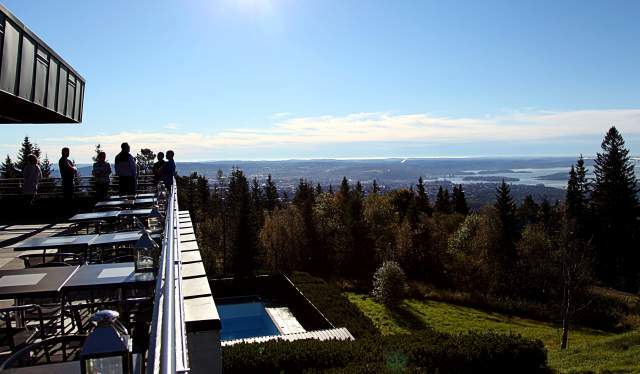 Oslo is surrounded by the vast forest area of Nordmarka, a great area for team-building activities. Within easy reach, it is possible to go hiking, biking, Nordic walking, or canoeing on one of the many lakes. Winter boasts the opportunity for great skiing, both downhill and cross country, tobogganing and horse sleigh rides. For those wishing to enjoy a more relaxing activity, wrap up warm and savour a tasty cup of hot chocolate in a lavvo. Read more at visitoslo.com/meetings/activities. In the harbour a number of charter boats offer trips among the many islands of the Oslofjord. These boats represent a different and increasingly popular way to entertain guests. You can also visit one of Oslo’s many world-class museums and sights, from Holmenkollen Ski Jump to the Viking Ship Museum or the amazing Vigeland Sculpture Park. Find more suggestions at visitoslo.com/meetings/attractions. Half day and full day excursions to the areas around Oslo are very popular items on a partner programme. Hadeland Glassverk, former iron works Bærums Verk and Drøbak at the narrowest point of the Oslofjord, are all within an hours drive from Oslo. Get more ideas at visitoslo.com/meetings/suggestions. Oslo offers a wide range of restaurants with capacity for larger groups. You may choose from good, old-fashioned rustic food, delicious dishes of fish, game, moose and reindeer, or stimulating culinary dishes from every corner of the world. The products come fresh from Nature’s own pantry. You can look for restaurants suitable for groups at visitoslo.com/meetings/restaurants. Oslo is characterised by a mix of old and new architecture, parks, hills, museums, monuments, lakes, forests and the fjord. It is a vibrant city, excellent for shopping, cultural and sports activities. The history of Oslo goes back 1,000 years, to the Viking Age, and embraces cultural giants such as Edvard Munch, Gustav Vigeland and Henrik Ibsen. Read more at visitoslo.com/meetings/history. Oslo’s climate is milder than the northern latitude might indicate. During the summer months, temperatures often equal that of cities much further south. Summer days are long, and the sun sets around 10:00 pm. Find more information about the climate in Oslo. Oslo will be the European Green Capital 2019, a testimony to the positive projects and initiatives aiming to improve the local economy and quality of life, in a way which is beneficial to the environment and inspiring to other cities. Oslo also ranks second on the Global Destination Sustainability Index, a collaborative business initiative created to help destinations, convention bureaus, event planners and suppliers to drive the adoption and recognition of sustainable practices. 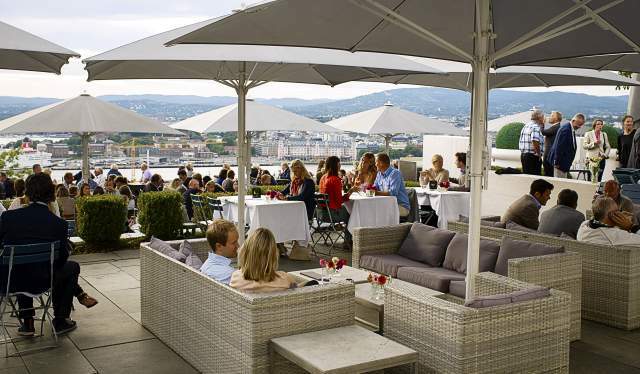 Oslo Summer evening at the Ekebergrestauranten. All trains arrive at Oslo Central Station (Oslo S), while regional and international bus routes stop at Oslo Bus Terminal. The stations are conveniently located at the main public transportation junction in the city centre. Nor-Way Bussekspress has daily departures from Oslo. Three ferries arrive daily to Oslo from Kiel, Copenhagen and Frederikshavn. They have first-class meeting facilities and exciting incentive programmes. Oslo is also a popular cruise destination, especially in the summer season. All cruise boats dock at the quayside in the centre of Oslo with walking distance to many of the city&apos;s attractions, such as Akershus Fortress, the Opera House, the Nobel Peace Center and the Royal Palace. For more information about Cruise boats, please contact Oslo Cruise Network. The main airport, Oslo Airport in Gardermoen, is located 55 kilometres north of the capital. The airport serves over 100 domestic and international destinations. From the Oslo Airport you can reach Oslo&apos;s city centre by the express train Flytoget (19 minutes), express bus, local train, hire car or taxi. There are also direct flights from dozens of European cities to Sandefjord Airport Torp (110 kilometres south west of Oslo). You can get to Oslo from the airport by bus or train. Oslo Meeting at the harbour. The capital of Norway is also its largest city with almost 650,000 inhabitants. Oslo Airport Gardermoen is 55 kilometres from the city centre, easily accessible by express train in about 20 minutes. There are over 200 international flights a day and 1,300 per week. There are over 80 hotels, approximately 12,000 rooms and 20,000 beds. In the vicinity of Oslo, another 15 hotels offer approximately 2,000 additional rooms. The largest conference hall has a capacity of 6,000 (theatre style). Oslo offers a unique location between the forest and the sea, ideal for outdoor activities.